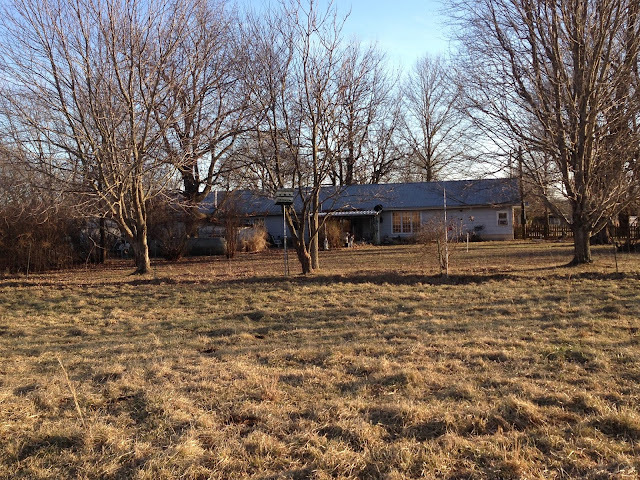 Since we decided to accept a renter for the farmhouse, we agreed to move our focus to cleaning up the farmhouse. Our first order of business was to rent a dumpster. The previous owners did a great job of clearing out the house -inside there wasn't a single thing they left behind for us to move out. So a few days after taking possession we had a dumpster of our own delivered, and the following weekend we set out to clear the garage and the yard of everything left behind. Y'all. This was like the yard-equivalent of Mary Poppins bag. We pulled one thing out of a corner and another item magically appeared where we would have sworn nothing else could fit. Items were hidden in bushes, thrown up in trees, camped out underneath weedy vines, etc. It was never-ending. 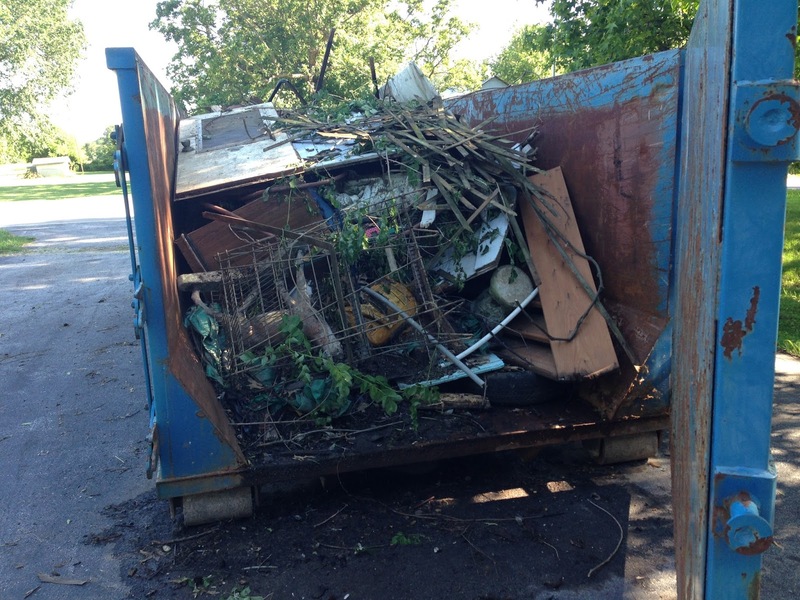 In 4 weekends, we filled and entire dumpster to the brim. And there was still more stuff we needed to get rid of! Here's a pic of the backyard as it was when we took possession of the property. As you can see, it doesn't look too bad from a first glance. But as we started getting into it, we realized that this was going to be a bigger project than we first imagined. Let me breakdown some areas. Each of these highlighted areas will have it's own post with details and stories, but here are the highlights. Area A is full of vines, thorn bushes and a couple small trees that are covered in honeysuckle. Its about 15 feet deep from the outer edge to the fence. This area will be covered more in-depth in an upcoming blog post, but for a highlight, inside this area we discovered flower pots, a beach ball, orange construction fence, plastic bags, abandoned metal fence posts and a lot of beer and soda cans. Looking at the vine area from the driveway/front yard. Clearing out loose brush by hand. Busting out the power tools. Area B also deserves its own blog post; but the cliff notes version says that this area is COVERED in Poison Ivy, and that Poison Ivy is hiding a few trees, a fence and a plethora of abandoned items. We're talking a collapsed metal swing set, car tire, a dog bed, collar and leash, plastic flower pots, concrete flower pots, Frisbees, and more beer and soda cans. How can all of that fit in this spot? No idea. It's the Mary Poppins yard, I'm telling ya. Area C. Oh my word. This spot was my nemesis. I was determined to get this spot cleaned up by the end of Fall. This was a home-made pond/water feature. This area had 2 birdbaths, close to a hundred flat stones, about a million red lava rocks, and was ringed by close to a hundred red landscaping edging stones. This is the best picture I have of the before. Remember, I wasn't planning to blog this! Those leaves are piled in a plastic pond container, that is full of mosquito water and frogs. Lovely. Area D was a mini garden. There was a tomato plant, a seashell, a fern tree and a bunch of ornamental grass. And about another 50 flat rocks. Spliced together and sealed with electric tape and duct tape. Following the wire to Area D.
The wire connects with Area D and continues into the side of the house. Area E hasn't been dealt with yet, but we call it the snake circle. Its a bunch of trash trees ringed by some sort of groundcover plant that they had placed deer statues in. And when we removed the deer statues we found a bunch of eggs inside one of the statues. We concluded that they were snake eggs, because just the day before we watched a 6 foot black snake scurry out of this area as we approached. I know black snakes are supposed to be harmless, and we didn't harm this snake, but we definitely got rid of the eggs. As you can see, there was a ton of work to do to make this place appealing, not to mention safe. We were doing our best to just dig out all of the trash to fill the dumpster. We didn't want the dumpster setting on the driveway for too long. It looks bad and it invites others to put their trash in it. Since dumpster fees are by-the-pound we really wanted to make sure we would only be paying for what we put in there. Here's what the first (yes, I said first) dumpster load looked like. Next, I'll start to share our work on specific areas of the yard.